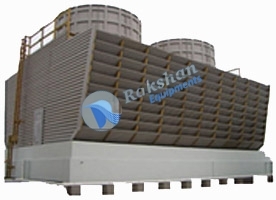 We manufacture and export Timber Cooling Towers in a variety of options to cater to various requirements of customers. These Induced Draft Cooling Towers are provided in Treated Timber Construction with ACB or FRP Casing & Louvers in Cross & Counter flow design. This conventional type Cooling Towers are exported with our “New Age” PVC fills & eliminators & with latest high efficient mechanical drives. Also, we provide this tower in multi-cells and in varied capacity ranging from 100 Cu M/Hr. to 3500 Cu M/Hr. in single cell. The entire range of Timber Cooling Towers is designed and developed by highly experienced engineers, who have complete industrial acumen and know well to satisfy the expectations of customers. • Durability : Long life under hazardous conditions. • Versatility :Can be used in direct contact with fresh or salt water.